The traditional AVMs are appropriate for origination and portfolio management – they are however totally inappropriate for the REO and Foreclosure (“foreclosure”) market. Subsequent to the bursting of the recent housing bubble, the foreclosure market has been growing nationwide, creating the need for specialized AVMs that could appropriately address that market segment. As such, the development of the foreclosure AVM is fundamentally and technically different from the traditional AVMs. Obviously, if the traditional AVMs are applied onto the foreclosure portfolio, the portfolio values would be unjustifiably inflated, creating false expectations from the market. Even when a statistical haircut is applied to the traditional AVM values to make them usable in the foreclosure environment, the application does not generally work considering foreclosure markets are inherently pocket-oriented. Of course, specialized foreclosure AVMs would be cost ineffective where foreclosures command a very small percent of the overall market. Unlike the traditional AVMs which depend strictly on recent arm’s length sales, the foreclosure AVMs must be developed off of the universe of foreclosure and short sales. Therefore, it would be easier to generate sales samples in those Metropolitan Statistical Areas (MSA’s) where foreclosures are common or are elevated. Due to the bulk purchases (REO to Rental) by major institutions in Sun states in 2012-13, the incidence of foreclosures had significantly subsided causing that glut of inventory to take a nosedive and prices to jump. As the institutions exited the market in late 2013 paving the way for the homebuyers and small investors to return, the foreclosure has started to return to normalcy there. So, only the foreclosure and short sales since their exit (Q3-2013: AZ, CA, FL, GA, NV and TX) must be considered for the sale sample. In other states where institutional involvement was significantly lesser, two years worth of sales (since Q3-2012) could be represented. In testing the representativeness of the sample, each of the three variable groups – continuous, categorical and fixed neighborhood – must be separately tested. At least, two of the four common continuous variables (Land Area, Bldg/Living Area, Baths/Bath Fixtures and Year Built/Age) must pass the 10th to 90th percentile test (not just the median), while a group of categorical (Style, Story, Exterior Wall, Heating and Cooling, Grade, Condition, etc.) and fixed neighborhood variables (Towns, Villages, School Districts, etc.) must also be successfully tested. Since these are non-continuous variables, the frequency percent test would be appropriate. The most liquid categories must successfully pass the test (please read our book entitled ‘How to Build a Better AVM’ for more developmental details). Time adjustment must take place in the form of quarters (instead of monthly) as quarterly adjustments are inherently statistically smoother than their monthly counterparts. Additionally, the broader markets (25th vs. 50th vs. 75th percentile) must be separately evaluated to find out if they have moved in tandem. If they have moved in tandem, the same set of time coefficients could be applied; or else, separate time coefficients must be derived from each value strata of the broader market. If the two most recent quarters show faster decay in value, an additional negative adjustment could be factored in, allowing adequate marketing gestation between the development and the shelving of values. Since time is a surface correction, it would be inappropriate to drill further down to the geographic areas, etc. (please read the chapter on Time Adjustments in our book entitled ‘How to Build a Better AVM’ for more details). While in traditional AVMs the categorical variables are generally assigned starting linear values auto-regressively, the foreclosure AVMs may take a combination of heuristic values for hierarchical variables and auto-regressive values for the other variables, considering the smaller sample sizes and the resulting illiquidity in many categories. In other words, hierarchical variables like Grade and Condition may assume heuristic values while non-hierarchical variables like Style, Story, Exterior Wall, Town and School Districts may take auto-regressive values. As the MRA models are run, the starting values would be adjusted. Due to the expected paucity of data points and variables in foreclosure AVMs, the significance level of the independent variables should be set at a lower level than the traditional AVMs. For example, if a minimum t-value of 2 is used to control the significance level in the traditional MRA model, it should be set at, say 1, in the foreclosure MRA model. Likewise, while running the multicollinearity matrix, the threshold must also be higher than the traditional model. If the threshold in the traditional model is set at +.3 or -.3, it should be significantly higher, say +.5 or -.5, in foreclosure model so that the variables are not easily removed from the equation. Traditional AVMs require significant amount of GIS and spatial analysis to define and quantify non-fixed planes and pocket areas. Those variables are then added to the MRA equation, along with the fixed neighborhood variables. Since foreclosures are more clustered and/or pocket-oriented, the concept of non-fixed planes does not take form. Therefore, instead of the traditional three-stage MRA model – additive, multiplicative and GIS – the foreclosure model would require only a two-stage model. In fact, if the foreclosure pockets within the model could be clearly identified and defined (using State Plane X-Coordinate & Y-Coordinate or Latitude & Longitude), they should then be introduced in the MRA as linearized clusters or pockets. Any more GIS/Spatial analysis would be overkill. Traditional MRA models are generally optimized by way of residual analysis. The most common form of residual analysis is the optimization of sales ratios (MRA Estimate / Adjusted Sale Price) of the categorical variables, meaning that the categorical variables are iteratively adjusted in a way that the individual sales ratios approach a median value of 1 (or 100 if percentile). On the other hand, since foreclosure sales samples are made up of widely diverging elements (level of consumer distress, urgency on the part of the lending institutions to liquidate REO portfolios, etc. ), extensive residual and outlier analyses would be a waste, further shrinking the modeling sample (please read the chapter on Residual Analysis in our book entitled ‘How To Build A Better AVM’ for more details). Therefore, the generally accepted quality metrics like Coefficient of Dispersion (COD), Price-related Differentials (PRD) would be unnecessary. Instead, a valuation review group consisting of internal foreclosure experts, selling brokers and AMCs (when involved) should be encouraged to study the foreclosure AVM values to determine their effectiveness. In 2010, Freddie Mac announced the use of AVM values for review appraisals to help lenders “more easily identify potentially inflated appraisal values that may need additional review early in the origination process.” On the heels of this announcement, the lenders holding large inventories of REO and foreclosures (late stage) would also be better served with the proposed specialized foreclosure AVMs, not only to price their portfolios more accurately, but to prevent appraisal frauds as well. Those AVM values should be used as control values to trigger the Supervisory QC. Simply put, the incoming REO appraisals must be compared against the AVM values and those that deviate from the internally acceptable range (say, +/- 20%) must be flagged for the Supervisory QC. Without such internal controls, those portfolios would be susceptible to appraisal frauds. AMCs should also use a similar approach to score and rank their appraisers. Note - Reprinted from my book 'Alternate Applications of AVM.' Now available on Kindle on Amazon (search 'Sid Som'). The continued rise in property values and sales tax revenues during the last market run-up – the two primary sources of revenue for most municipalities – kept unsustainably inflating their annual balance sheets, while continuing to give taxpayers the impression that they were all fundamentally sound and healthy. On the heels of that artificial financial strength, most municipalities became way over-optimistic and began to over-extend themselves by floating general obligation bonds (against projected growing revenue streams) to balance their budgets. Unfortunately, that optimistic scenario of perennial and unrestricted revenue growth did not come to pass. The collapse of the property market during the Great Recession in not too distant past coupled with the dampened sales tax revenue dealt a severe blow to the municipal finance, thus forcing many renowned bond market analysts to predict that many American cities would be in serious financial trouble. Today many towns and cities (case in point: Detroit) are in dire financial straits. Since the property tax revenue is often the primary revenue source for most municipalities, the reinvention of the property assessment practices in line with the changing market dynamics is critical. Despite what the purists say, the practices that worked in good old days do not necessarily work anymore. They require significant market adjustments; for example, the old assessment books may still call for annual reassessments to produce a fair and equitable roll – not necessarily true anymore considering that the easy copout practices – raising taxes, bonding out fictitious futuristic revenues, etc. – may nowadays be infeasible altogether. We all agree, property markets like the financial markets have become extremely volatile and this volatility is here to stay. Although the conventional wisdom favors the annual reassessment, today it simply promotes chasing a volatile market, automatically paving the way for a rising tide of assessment protests. Annual reassessment might have worked in olden days when markets were more stable and predictable, but that practice does not work under the changing market conditions, especially when the valuation date is futuristic or semi-backward which is fairly common (see # 2 below). Moreover, in terms of the available manpower, local governments are becoming increasingly leaner and meaner. Despite all this, an assessment roll must be fair and equitable, by definition. Therefore, we need to move to a cyclical system if we truly care about the metallurgy of the roll. Naturally, the question arises: Should it be a 2-year, 4-year or 6-year cycle? There is hardly any difference between the annual and 2-year cycle from the volatility and resource point of view so the latter offers no solution whatsoever. On the other hand, 4 and 6-year cycles are too far in the distant future to have any meaningful control over to stay in sync with the market. Thus, the 3-year cycle, with a backward-bending valuation date, would be the logical choice in achieving assessment goals while optimizing resource allocation. As the new data points come in, we will see the emergence of an obvious bell curve, with roughly 68% of the municipalities opting for the 3-year cycle. The two tail-ends of the curve would be represented by the 1 to 2 year and 4 to 6 year cycles. The 3-year cycle could be easily achieved even with a 50% reduction in the workforce (I am not proposing any reduction in workforce - just testing a hypothesis), without having to sacrifice the basic objectives of the assessment roll. Since most taxing jurisdictions have either futuristic valuation date (next Jan, Apr, Jul, Oct, etc.) or semi-backward date (backward-bending but less than one year; for example, status date is next Jan but the valuation date is prior Jul), the assessment process – annual or cyclical - necessarily promotes a huge market gamble, which in turn produces a vastly inaccurate and indefensible roll, thus encouraging mass protests and refunds requiring a wasteful juggernaut of separate reviewers and servicers. Over the years, such review services have needlessly grown in size and scope costing taxpayers a significant bundle. Therefore, a truly backward-bending valuation date is needed. By backward-bending valuation date I mean setting the valuation date one year back to level the information playing field. Thus, the futuristic gamble and the resulting comparative advantage in terms of the available market data are removed from the assessing equation altogether. Under the current system, the counter-party has a comparative advantage over the assessor who is inherently constrained by the futuristic gamble. For instance, if the status date is 01-01-2015, the valuation date must be 01-01-2014, allowing all parties to have equal access to the available market data. Additionally, the rightful use of the market data (say, 2 years of residential sales and 3 years of incomes and expenses, etc. including time adjustments) must also be statutorily pre-established (legislated or chartered) to avoid having to deal with comps and metrics from conflicting periods. Even the municipalities who plan on sticking to the annual process should seriously consider the proposed backward-bending valuation date to protect taxpayers. In order to break away from the old zero-sum rule of assessing, municipalities within the county should undertake their own assessment. If a county has 50 different municipalities with their respective budgets, assessing must be decentralized, occurring at the municipality level so their assessment uniquely caters to their respective needs and services, without having to finance or depend on others. If the county additionally imposes its own property taxes, it should be responsible for its own component only, mutually exclusive of its municipalities. Over a period of time, those municipalities will learn to manage their own budgets and will become self-reliant. For example, if a municipality has very low commercial component, it can entice new businesses in by creating enterprise zones and offering reasonable tax holidays or abatements. Until municipalities learn to take a customized approach to their own assessing, their long-term financial owes will not be meaningfully dealt with. With the introduction of mass appraisal modeling (CAMA and AVM), assessing has become more a science than an art. The efficiency of mass appraisal however depends largely on the quality and currency of the data. If the physical changes are not captured, sales are not validated, and incomes are obsolete, the roll will not be efficient irrespective of whether it is cyclical, decentralized or with a backward-bending valuation date. While a decentralized assessing is advisable, a uniform database structure and centralized warehousing under the oversight of the county would be ideal to maintain the orderly entry and maintenance of the data. If the county provides the oversight, the possibility of a bi-modal data management – one group staying up-to-date while the other perennially lagging behind – could be avoided. The oversight group should also help municipalities with structured analysis like complying with the IAAO guidelines, etc. before the rolls are finalized and sent over to the state board. Of course, at the end of the day, the individual municipalities would always be responsible for their assessment rolls and budgetary controls. Since a centralized warehouse with a uniform data structure is advocated, obviously a 3rd-party CAMA package (or the state package if available) would be needed at least at the warehouse level. Considering most CAMA packages also offer valuation modules or connections to the external software, the larger municipalities could use the CAMA option for valuation as well, while the smaller counterparts could use a generic package if the CAMA option is too heavy for them. In that case, the county oversight group should do the legwork and suggest the appropriate package to the municipalities depending on the need, thus any potential politics or favoritism could be avoided to protect taxpayers. Some CAMA packages have quality warehousing and billing and collections components but have poor and outdated modeling/valuation component. If such a CAMA package is selected, the oversight group may suggest a hybrid compromise. Since the state and local government workforce is shrinking almost everywhere, it is critical to undertake proper manpower planning for all new hires considering the civil service requirements. Again, assessing has increasingly become more science so staffing the modeling/valuation department requires additional game planning. Modelers must have quantitative background – from statistics to mathematics to physics to applied economics to applied psychology to applied geography to operations research to industrial engineering. Candidates with business, liberal arts and computer science degrees bring inadequate modeling skill-set to this department. Of course, due to any hiring freeze, etc., if the department has to be built off the existing workforce, an enterprise-level search must be conducted to identify the hidden quantitative talents. Every attempt must be made to hire a knowledgeable leader – with an advanced quantitative degree and industry standing – to manage the department; traditional assessors are totally inappropriate to lead as they invariably slip into traditional way of assessing for lack of hands-on knowledge of mass appraisal modeling and econometrics. Whether the modeling/valuation department will be successful or not will depend primarily on the leadership. In a cyclical environment, field, data collections, mapping personnel could be all Per Diem (hire the year before the valuation) to have the most up-to-date data, while the exemptions and customer service personnel could be all seasonal. The cost of all common data collections must be shared pro rata by the municipalities. A few senior managers along with a small front office, modeling/valuation and quality improvement should comprise the full-time permanent staff. This type of manpower planning would be consistent with the cyclical system, thereby effectively optimizing manpower application while significantly improving roll accuracy and overall enterprise efficiency. The age old practice of grooming chief and deputy chief assessors from within the system or drawing from the competition is a failed concept. Since these positions require exceptional leadership skill and vision, home-grown smart assessors with high level of technical assessing skills alone do not cut it anymore. It is high time that the municipalities, particularly the Assessing agencies and the rest of the Finance vertical, should take and coin examples from corporate America in choosing their top-line leaders. The reason the top-school MBA’s go on to become successful CEO’s of major corporations is that they are specially trained to be professional managers and leaders irrespective of the type of business or industry. Now that the corporate CEO’s are hired from around the world, the increased competition would force many top-school MBA’s to consider careers in local governments. Therefore, those jobs, especially the ones from the larger jurisdictions, should also be advertised in national newspapers and WSJ, highlighting the challenge and the reward. Even if a small percentage of those MBA’s are amenable, it is going to be a win-win situation for the taxpayers. The technical interview to hire a Chief or Deputy Chief must not be internalized, which would simply promote more politics and favoritism; it should be conducted by a group of local CEOs, renowned professors and other industry leaders. I am however aware that the vast majority of jurisdictions have statutory qualifications for at least the Chief Assessor so some legislative changes might be required. Since property assessing is being totally reinvented, those backward-bending qualifications and requirements would be scrapped – just a matter of time. Meanwhile, consider only the smart assessors with MBA’s, from within (the agency or the industry at large). The old way hardly returns any value to the taxpayers – only promotes status quo, at best. Before, risk management was never part of producing assessment rolls. The same linear CAMA models or unscientific experimentations created exposure and refunds year after year. Instead of improving the roll by dint of more meaningful non-linear modeling and up-to-date data, fingers were pointed at others to deflect having to take responsibility. Unless statutorily required, most jurisdictions did not recycle judicial decisions even for the large commercial properties, citing different status dates. Therefore, as the industry moves towards the cyclical assessing, all judicial decisions irrespective of the state/local statutes must be recycled during the following cycle, minimizing unnecessary protests and refunds, as well as lesser consumer harassments. Many county executives are already moving in that direction, introducing and emphasizing proper risk management by subtly rejecting the old thinking/theory of unequal and/or selective assessment practices. While unequal and selective assessments are real issues in annual reassessments, they will be ironed out in cyclical systems as protesters get multiple years to monitor and even out the kinks. In a jurisdiction if 10,000 residential sales are annually generated, it makes no statistical sense to hand-work and validate them individually. Proper market metrics must be developed to cleanse them statistically and only the fall-outs should be individually scrutinized. In fact, as the knowledge base is refined, the fall-out rate will continue to shrink giving better bang for the buck. The annual income and expense data (where collected) should also be subjected to similar statistical validation. Permits data should be no exception. The implementation of statistical validation not only reduces subjectivity and enhances modeling efficiency, but it also eliminates thousands of un-worthwhile man hours, regular and overtime. The modeling/valuation team should be able to derive proper validation metrics from their regression runs and related analytics. Commercial sales are more complicated and generally are few and far between so they should be individually validated. While municipalities would be assessing on their own, they should periodically meet and share knowledge with one another to avoid having to reinvent the wheel. If a county is new to modeling, it should consider talking to the neighboring counties having modeling knowledge. Thus, they could reduce the need for and dependence on the outside consultants. They should only consider bringing in the outside consultants after having exhausted all of the free and vastly inexpensive routes. At the end of the day, these are all taxpayers’ dollars so they must be deployed keeping their interest ahead of all others. It makes no sense to hire a $2,000/day consultant to teach the basic modeling courses. Given the dire straits most municipalities are in, assessment departments must genuinely explore new revenue sources. Since civil servants are generally protected from layoffs, etc., their expertise should be leveraged to raise additional revenue. As these departments move from the annual to cyclical systems, their full-time modeling staff should have significant non-peak time between rolls, allowing them to amortize their expertise in the marketplace. For example, if an assessment department has advanced commercial modeling expertise, they should consider taking it to the private sector and compete with the AVM houses by offering penetration pricing to get into the game. To save jobs, today civil service/unions would be more flexible to redo employees’ job descriptions to accommodate this new way of approaching work. The assessment practices that worked even a few years ago do not work anymore. Consider the 3-year cyclical assessing with a backward-bending valuation date to keep your municipality afloat. 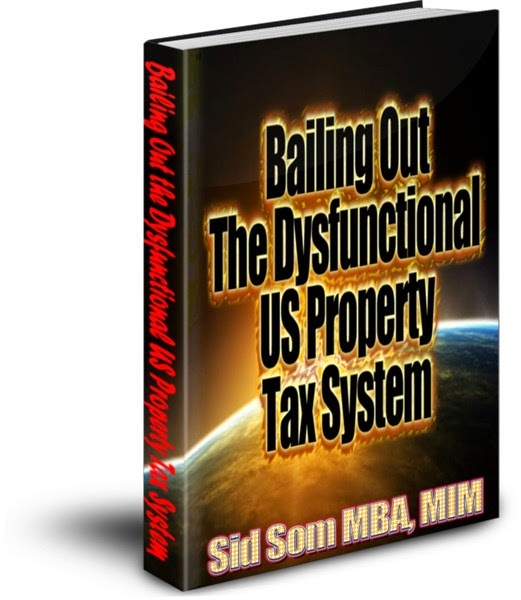 Excerpt from our book 'Bailing out the Dysfunctional US Property Tax System.' This book is now available on Kindle on Amazon (query 'Sid Som'). According to Amazon, "Anybody can read Kindle books—even without a Kindle device—with the FREE Kindle app for smartphones, tablets and computers."